McDonald's has eliminated the McWrap from its menu, Bloomberg reported and McDonald's confirmed. Bloomberg speculated that McWraps were not popular with millennials, although their $3.99 price, steep in 2013 when they were introduced nationally in the U.S., may also have been a factor in a tight, cost-conscious economy. Millennials needn't be the reason for everything that happens. 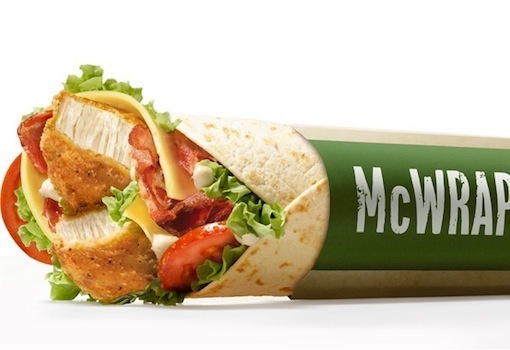 Although Mexican in style, the McWrap actually develop by McDonald's Poland operation in 2004. Introduced here in 2013, the McWrap line was one of the reasons former McDonald's COO Tim Fenton admitted a year later that the chain had "overcomplicated" its menu. Franchisees complained that McWraps were too time-consuming to prepare. Few, and not just millennials, will be overly saddened by their demise. But the McWrap caught on globally and continues on the menu in many countries. 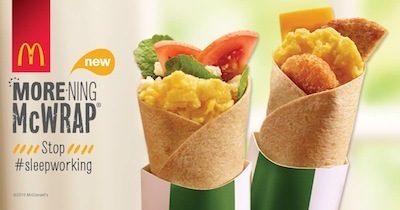 McDonald's Canada still has its Signature McWrap line and last year and last fall added More-ning McWrap breakfast wraps (below). Big Flavour Wraps, including a BBQ Pulled Pork variety, are on the McDonald's UK menu. And Australia has embraced the McWrap like no other country: It has two Snack Wraps; three Brekkie Wraps for breakfast; two Aïoli McWraps; and two Spicy Mayo McWraps. Other chains joined the wrap trend. In the U.S., Wendy's tested Baja Wraps and BBQ Wraps before launching a line of Fresh Wraps in 2011. Burger King introduced Crispy Chicken Snack Wraps in 2012. November 2010: McDonald's USA tests full-size "Fresh Garden Wraps"
April 2016: McDonald's USA says the McWrap has left the building.